Health insurers’ policies to reduce costs, such as step therapy, prior authorization, and nonmedical switching, often interfere with health care providers’ treatment decisions. As a result, not only do such policies delay or prevent patients from accessing their prescribed care, but they also hinder providers’ ability to obtain payment and create costly administrative waste for medical practices. 77 percent of PCPs report that their practices have to hire additional staff to address health insurers’ requirements, thereby significantly increasing their practices’ administrative costs. 75 percent state that insurers don’t honor their commitments. Insurers say they will cover treatments but then refuse to pay for them. 65 percent feel that their practices face greater legal risks because of health insurers’ decisions. For further findings, view the Survey here: https://aimedalliance.org/providerperceptionssurvey. What laws protect you so that you can obtain payment for treatments and medical services you have provided? Prompt Payment Laws. These laws, which vary from state to state, require insurers to pay providers’ claims within a certain time period. Noncompliant insurers are subject to penalties or other sanctions. Contract Law. For participating providers in managed care contracts, insurers must strictly adhere to all terms of the agreement, including those related to payment of claims. If they do not, they are in breach of the contract. Breach of Duty of Good Faith and Fair Dealing. Every contract imposes a duty of good faith and fair dealing, which requires both honesty and reasonableness in the enforcement of the contract. An insurer may breach this duty if it unfairly frustrates a participating provider’s right to receive the benefits of an agreement actually made. Intentional Interference with the Doctor-Patient Relationship. If a provider can show that an insurer intentionally and improperly interfered with the contractual relationship between the provider and patient, and that interference injured the provider, then the provider may be able to assert an intentional interference claim and seek damages. How can you help your patients access prescribed treatments and services? Appeal the Decision. Inform your patient that he or she can ask the insurer to conduct a full and fair review of its decision. Request an External Review. Under law, your patient is entitled to take his or her appeal to an independent third party for an “external review.” Your patient may do so if the internal appeal is denied, or if the patient’s medical situation needs immediate treatment and waiting would jeopardize his or her life or ability to function. File a Complaint. If there are still problems after the external review process, your patient can file a complaint with the insurance commissioner or attorney general in his or her state or the U.S. Department of Labor, if appropriate. Doing so will help state or federal officials identify patterns and practices of bad behavior. For more detail on the appeals process, please visit www.CoverageRights.org. Encourage your patient to contact the media to report egregious behavior by insurers. Oftentimes, bad publicity will result in a positive appeals determination. Streamlines benefit utilization management policies to reduce administrative waste and burden on both providers and patients. Makes the appeals and exemptions processes easier for patients to complete on their own. Requires insurers to provide additional levels of transparency to plan enrollees. Join physician associations’ and advocacy groups’ policy efforts dedicated to removing restrictive health insurance barriers. Encourage patients, caregivers, and family members to share their experiences with insurers with local, state, or national patient advocacy organizations dedicated to improving patient access to treatments. Private Health Insurance: Data on Application and Coverage Denials, U.S. Government Accounting Office (March 2011), https://www.gao.gov/assets/320/316699.pdf. Visit Aimed Alliance’s “Know Your Rights” video featuring Aimed Alliance’s Director of Medical Affairs, Dr. Shannon Ginnan, https://www.youtube.com/watch?time_continue=1&v=Zs37niIA-JI. 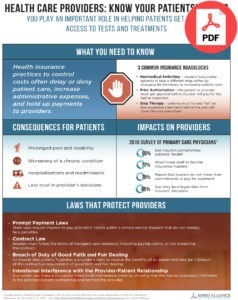 Visit Aimed Alliance’s “Know Your Rights” website to find additional materials developed to help patients, caregivers, and providers navigate health insurance denials at www.CoverageRights.org.